"Writers association for abandoning-nuclear-power society" newsletter Vol. 15. Tanka Poet Mariko Kitakubo. Contemprary Tanka Poet Mariko Kitakubo. Contemprary Tanka Poet Mariko Kitakubo. Article details. "Writers association for abandoning-nuclear-power society" newsletter Vol. 15. 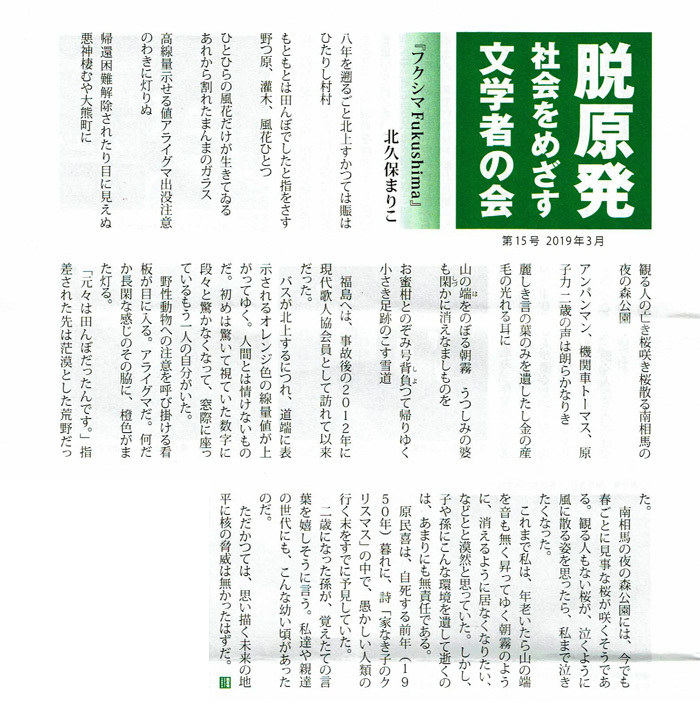 In the newsletter volume 15 of "Writers association aiming for abondoning-nuclear-power society" issued in March, 2019, 10 pieces of my tanka and my article about the trip to Fukushima where I visited as a Environment Committee member of the Japan P.E.N.Club are posted.